This was made with the PTI stamp set Life designed by Lisa Johnson, I love this set some of the sentiments are beautiful ans the foliage is all suitable as silhouettes. I stamped onto a very deep coloured purple card stock using Versamark and white detail powder then heat embossed it, the white paper border was made using a 3 in 1 punch made by Kreaxions, I wish I'd bought a couple of these punches when I was at Harrogate as I can't seem to find a stockist in the UK. Very beautiful card. I love the punched sides and the colour. Gorgeous card Jak and i too love the punch you have used. Fab colour too. Beautiful Jak. 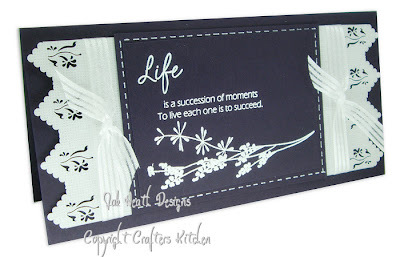 Love the punched border, really dramatic. hey, jak does this mean you are feeling better? Your cards this week are beautiful as always! Lovely card Jak, love the punched edges very pretty. That is so simple and stunning Jak. Love those punches too. As usual a stunning card. Love the punch detail, wish I could get one. Will have to watch out for them sigh! !